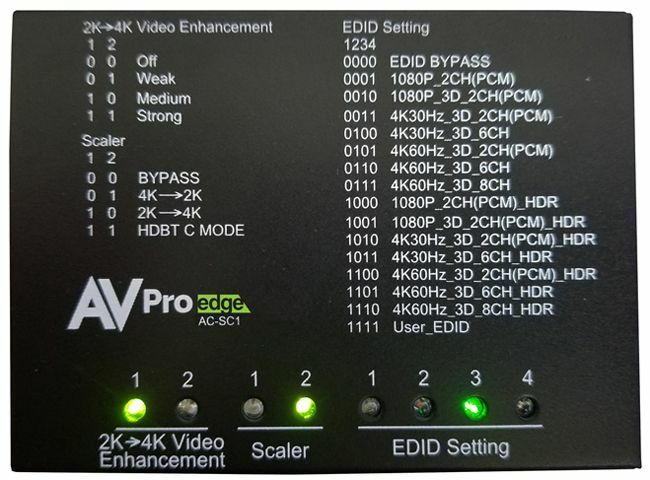 AVPro Edge AC-SC1-AUHD 4K HDMI Up/Down Scaler is the ideal solution for integrators that are needing to distribute a signal to a variety of displays and keep an optimal picture. Integrators will enjoy it's versatility of not only being able to control up/down scaling but handling EDID issues (including 4K HDR EDID's), image enhancement, and being able to access audio from the stream. This scaler is ready for future content as well as it's able to distribute 18Gbps signaling. Yet if you have 1080p displays the AC-SC1-AUHD will make sure it's getting the right picture. This product works great alongside one of the AVPro Edge's Matrix's allowing yourself to give the customer the best resolution possible. Full HDR Support: With a plethora of HDR EDID's to choose from, HDR is now able to be activated on capable displays no matter what the infrastructure requires. This allows flexibility in system design and allows you to maximize a budgets by providing HDR content where you want it. 4K 1080P Down Scaling: This is possibly one of the most important features in the mixed system. 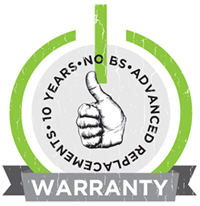 Most AVR's, matrix switchers, and other peripherals do not have the ability to scale. Typically, 4K systems are limited to the maximum resolution of the cheapest or oldest display, which is normally 1080P. If you took the most expensive 4K matrix, you would still have to "dumb down" the entire system to be compatible. The AC-SC1-AUHD is the solution! Simply place the scaler in before the 1080P display/s and enjoy 4K content on the capable displays while keeping the same content on the 1080P display/s. 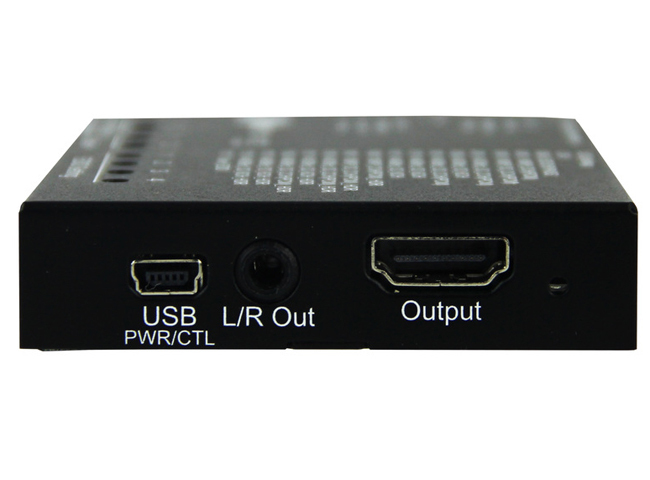 HDBaseT Compatibility Mode (HDBT-C): This EXCLUSIVE AVPro Edge technology will allow conversion of high bandwidth signals (between 9 Gbps - 18Gbps) like UHD Players, HDR Content, Gaming Systems, PC's, and Media Players. This type of conversion uses a proprietary algorithm that minimally impacts the original image, therefore, passing transmission of HDR and high bandwidth signals over long distance transmission devices like HDBaseT Extenders (AC-EX70-UHD). It also supports the use of a display that does not support 18Gbps. Best of all, this is managed on a per output basis which allows for complete control over what individual runs are "down-clocked"
1080P 4K Up-Scaling: This feature combined with the image enhancement circuit will take those drab 1080P sources and dazzle on a 4K display. A 4K display will automatically upscale the picture to 4K (ultimately relying on a display component), however, it will not look as professional, had you used the AC-SC1-AUHD. The Most Advanced EDID Management: There are 16 pre-loaded EDID settings from legacy technology (1080P) to full 4K and HDR Options. This is the only device that will provide this unique EDID combination. The AC-SC1-AUHD also has custom user EDID for future use, total customization and EDID bypass for using the sink EDID. 2K 4K Video Enhancement Circuit: Maximize the viewing experience when enabling this circuit! Legacy content will certainly be in every system these days, but this feature ensures that the best possible image is provided on the new 4K displays and projectors. 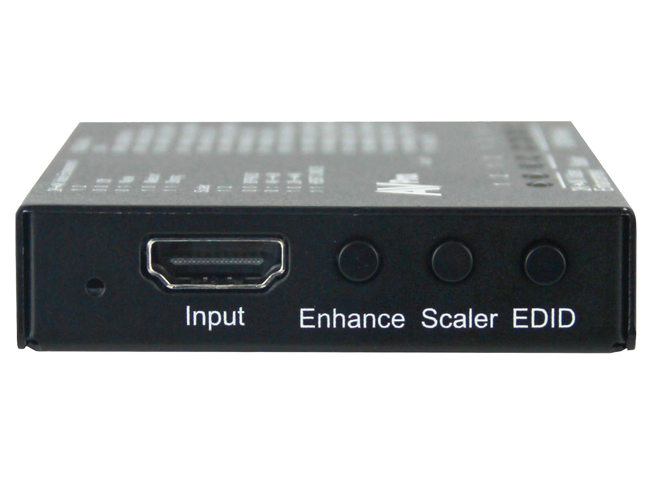 Why not buy this AVPro Edge AC-SC1-AUHD 4K HDMI Up/Down Scaler today?